Got a bit of inspiration the other night and devised a clever (IMO) way to enhance my home treadmill to autobelay as I practice climb with my rope walker. I had been self belaying and that's always worked perfectly fine, but I simply wanted to experiment and see if an autobelay setup could be done, and as a bonus to see it it could be done with a minimum of extra gear and expense. Succeeding on both accounts, I shared a video of a prototype with some friends last week and the response was universally positive. One longtime caver encouraged me to post it here as he has never seen or heard of something like this discussed or done before. And more importantly... it automatically starts and stops the rope, controls the speed dynamically with the climber, and automatically adjusts/tensions itself up when you start. Getting on/off is no more complex than normal. Hold the belay side and climb up, as you do this both the upper and lower tethers (see below) are automatically tensioned. “Look ma, no hands!” Let go and climb! Get tired? Stop climbing. It stops with you. Down a coffee? It speeds up with you, then slows down or stops when you crash. All done? Grab the upside down ascender, push down, and float to the ground. 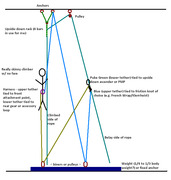 It starts with the basic self-belay setup with an upside down rack directly above the climber (I'm using 4 bars), a pulley rigged above and a little bit away from the rack to feed the rack, and the tail of the rope falling back to the ground for belay. I have to give credit to the kind folks on this forum who presented photos and descriptions of that setup. It has worked very, very well for me. 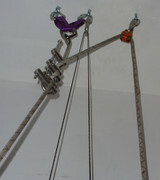 Together, these two act as a surrogate hand to automatically belay you and maintain your position in midair. Particularly helpful if you have your treadmill in a tight space (my space is only 18' tall) and don't mind the feeling of not going anywhere and climbing in place and/or if you don't have access to a willing belayer when you wish to practice. Welcome to the forum, and thanks for sharing. Post pictures of your auto belay as well. I am having trouble visualizing your setup. Ive used the self belay for miles, yours seems like a great evolution. and to get down i take it you just manipulated the klemheist? Chads93GT wrote: and to get down i take it you just manipulated the klemheist? Similar to the way the upside down ascender pushes down, releasing the klem during climbing to release the knot, I just grab the ascender and let gravity take over. The same is true if the french wrap is used in place of the klem. I haven't used both of them enough to decide which I like best for this setup. The ascender BTW is truly overkill for this, anything that can clip (or tie?) onto the rope, and slide freely when dragged downward to release the friction knot as you climb may work in it's place. There is no need for teeth or camming action. It's mainly just needs to slide down freely so it is always resting on the knot and have a point to tie a tether to it in more or less inline with its intented motion down belay side of the rope. I'll take some detailed pictures the next time I pull the rope out - hopefully w/in a few days. And some close up video in action of at least that piece. Thanks for the kudos all. I'm happy to give something potentially useful back to the group after all that I have learned here and in real life adventures. dseasholtz wrote: Very cool Jon! Since this is "No hands" then it could work for any climbing system? lefalaf wrote: The ascender BTW is truly overkill for this, anything that can clip (or tie?) onto the rope, and slide freely when dragged downward to release the friction knot as you climb may work in it's place. There is no need for teeth or camming action. It's mainly just needs to slide down freely so it is always resting on the knot and have a point to tie a tether to it in more or less inline with its intented motion down belay side of the rope. Sounds like a job for a small Prusik-minding pulley. Can you post a diagram or photo with labels showing your setup? I trust a PMP would work. I don't have one, but I bet I can test similar well enough with the pulleys I have. ...and take photos to annotate. cavedoc wrote: Since this is "No hands" then it could work for any climbing system? huh. pretty clever. Is that just weight on the floor or is it secured somehow? I'm having trouble visualizing it all -- a diagram would be super-useful. chh wrote: huh. pretty clever. Is that just weight on the floor or is it secured somehow? Yup, that's just weight. A permanent anchor in the floor would be more ideal but this is inside my foyer, so... I'm using a short stack of 10" and 12" pieces of pressure treated lumber I happened to have handy. The need is to have something that is enough to counteract the load placed on it by the tethers. ~1/3 of my weight seems to be plenty to keep both bottom anchors in place. From left to right, you can see the middle section of the upper tether running from ceiling to floor, then the lower tether from the floor to the upside-down ascender, then the upper tether from floor up to the friction knot. Belay (pulley in place of the upside-down ascender) w/bottom anchor. To the left you see the biners which attach to the climber. the red one to the back of the harness and the other to the front. I found this particular pulley didn't operate as efficiently as the ascender. Perhaps a PMP would work better. I don't own one, but feel free to try and let me know how it goes!